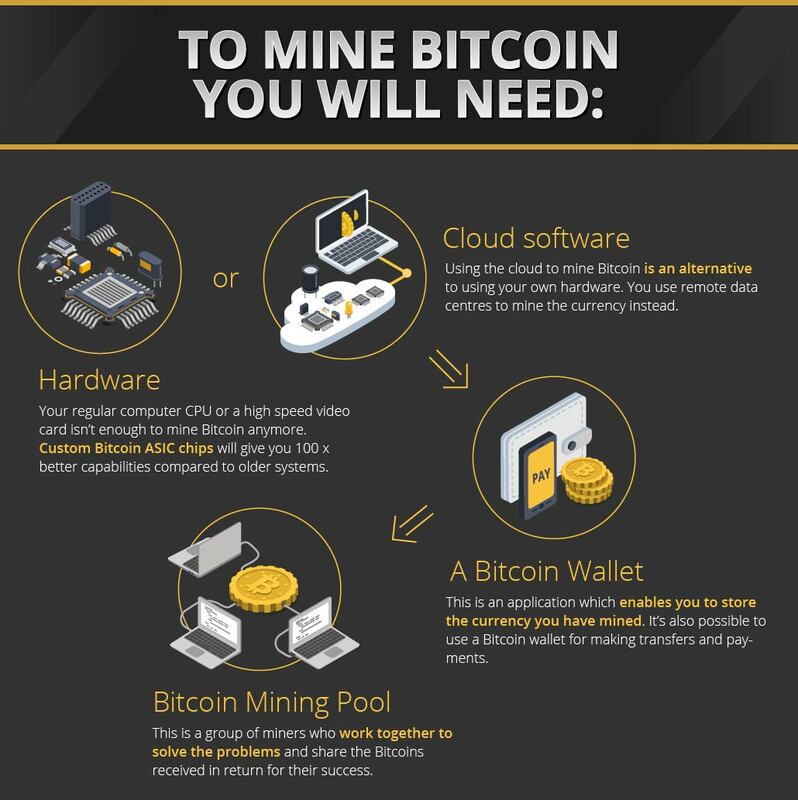 Do You Have What It Takes To Mine Bitcoin? Bitcoin Pro > Do You Have What It Takes To Mine Bitcoin? Most people have heard of Bitcoin but perhaps they aren’t sure exactly what it is or how it’s used. Bitcoin is a type of cryptocurrency- a currency which is created and used online. 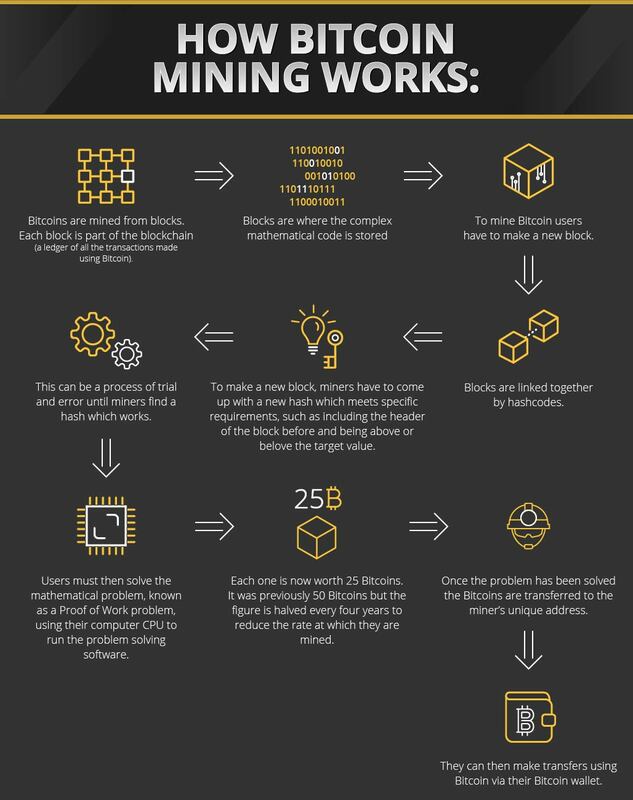 The creation process, known as mining, is an area of interest for many people- particularly as it’s possible to make money by creating bitcoin. Bitcoin mining involves harnessing a computers processing power (CPU) to run software which will solve the complicated mathematical algorithms required to create Bitcoin. We’ve explored exactly what Bitcoin mining involves in detail, so read on to find out whether you’ve got what it takes to mine bitcoin. Anyone can begin mining Bitcoin, as long as they have the necessary computer equipment. In the past, it was far easier for people with regular computers to mine bitcoin. However, there are only 21 million Bitcoins in total and 15.2 million of them have already been mined, so it has become far more difficult for miners to create Bitcoin. People who are interested in starting to mine Bitcoin will need to invest in some robust technology. Most people use a powerful computer with a customised chip which is capable of meeting the high processing demands which running mining software. A common alternative to buying your own hardware is using remote data centres in cloud storage systems, as this doesn’t require enormous amounts of electrical output or expensive computer chips. However, cloud mining is often less secure than an individual’s own set up. So, exercise caution when using cloud data centres. Miners store their hard-earnt Bitcoins using a Bitcoin wallet. This is a specialist application which helps to keep the currency secure and enables people to make peer-to-peer transfers and payments safely and quickly. Every transaction made using Bitcoin is stored in the Bitcoin blockchain, a centralised database which is visible to anyone in the network. Finally, potential miners may want to join a Bitcoin mining pool. A mining pool is a collaborative network of miners, who use their combined CPU to work together to solve the algorithms. Joining a mining pool is beneficial because it makes it quicker and easier for the Bitcoin to be mined. It is also more secure as the currency is transferred from the pool. The downside is that rewards are split between the group of miners, meaning that an individual miner may get less than they would if they were mining alone. What Exactly Does Bitcoin Mining Involve? 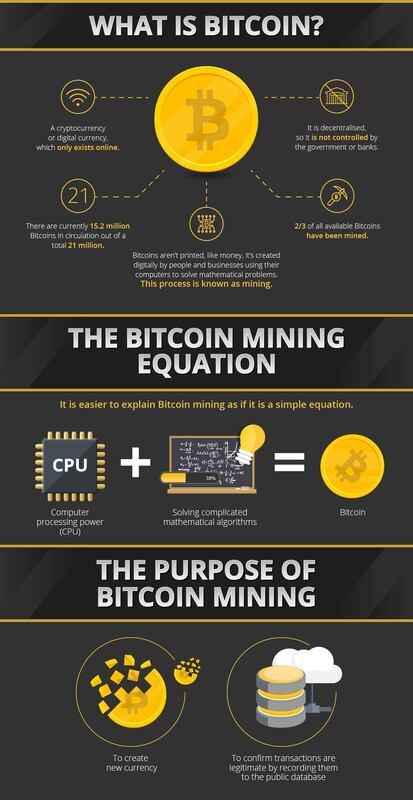 The mining process sounds complicated but it’s fairly simple to understand once you know the steps involved in creating Bitcoin. Bitcoins are mined from blocks of data, which are stored in the blockchain and linked together by hashcodes. As we mentioned earlier, the blockchain is where every single transaction made using Bitcoin is stored. This huge ledger is visible by anyone in the network, which is part of what makes the cryptocurrency so trustworthy. To mine Bitcoin users have to create a new block, which can only be done by finding a new hashcode. Each new hashcode has to meet a number of highly specific requirements, such as including the header of the previous block and inputting a nonce- a string of numbers which has to be below or above the target number. The purpose of this complex process is to make it extremely difficult for people to alter the block without others noticing. Understandably, finding the right nonce to create a new block is largely a trial and error process. Once users have successfully created a new block, they then use their CPU to run software which will solve the Proof of Work problem. Once this is complete, miners are rewarded for their efforts with Bitcoin. At the moment, each block in the blockchain is worth 25 Bitcoin but this value halves approximately every four years to help reduce the rate at which the Bitcoins are mined. Miners can store their Bitcoin in their wallet and spend them however they wish. Is Bitcoin Mining Getting Harder? Bitcoin mining is increasing in popularity. More and more miners are joining the network and creating blocks every day, which makes it much quicker for new blocks to be created. 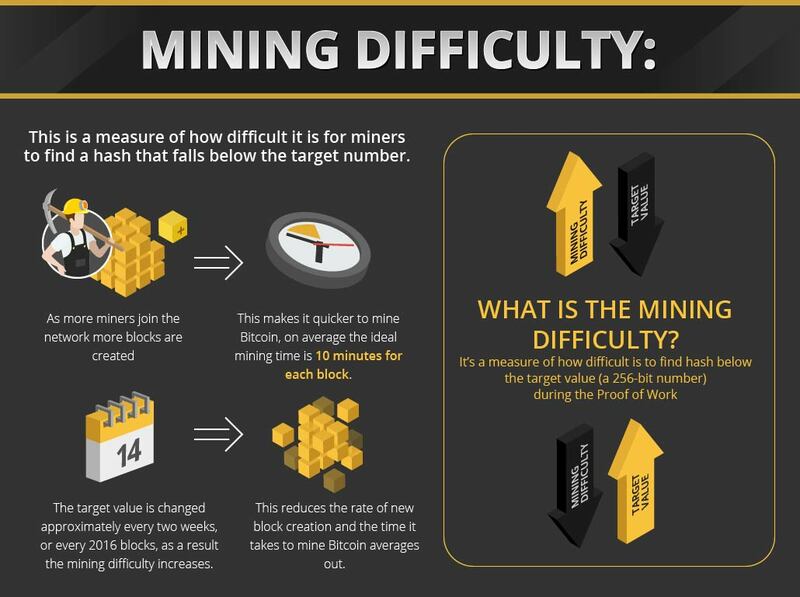 Bitcoin mining difficulty is used to determine exactly how hard it is to find the hashcode. If the target value didn’t change every two weeks, it would be extremely easy to create new blocks and the currency would deplete very rapidly. At the moment, the ideal mining time is ten minutes per block but it’s likely that Bitcoin mining will become more difficult and time consuming in the future. 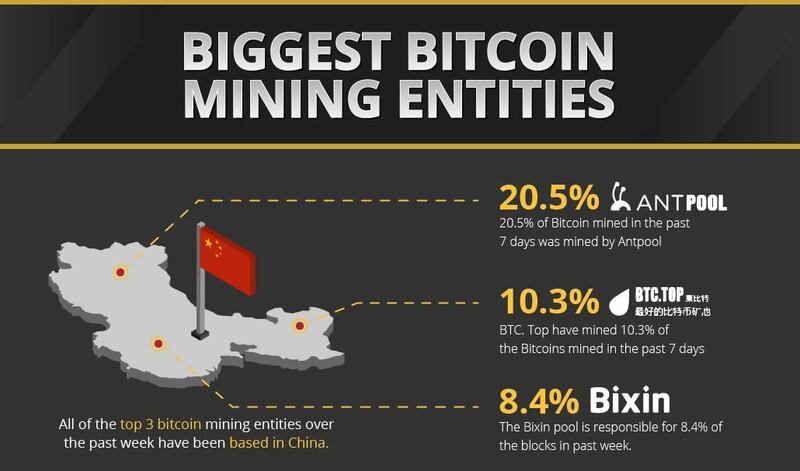 China is one of the leading countries currently mining Bitcoin. The top three mining entities from the past week, AntPool, BTC.TOP and Bixin, are all mining pools based in China. This is a pattern which is set to continue, as China is investing heavily in Bitcoin startup companies. There are 20 significant Bitcoin companies based in the country at the moment which are collectively responsible for around 70% of Bitcoin’s global trading volume. In the future, it’s likely that the US and Russia will provide competition but for now China remain one of the most powerful countries in the Bitcoin network.